I remember the first time I went to Wyoming as a kid with my dad, and they had Jackalope postcards everywhere. I was fascinated. What the hell was this amazing creature, and how come I’d never heard of it before? This fantastic hybrid looked like any ordinary rabbit, except it had deer-like horns on top of its adorable head. It was like a cowboy chimera, and I vowed to canvas the Wyoming landscape until I saw a Jackalope with my own two eyes. Needless to say, I never did manage to catch site of one. Los Angeles artist Luke Chueh feels my pain. To make up for this scarring childhood memory, Chueh has designed “Jack”, a limited edition sculpture manufactured by Pretty In Plastic. 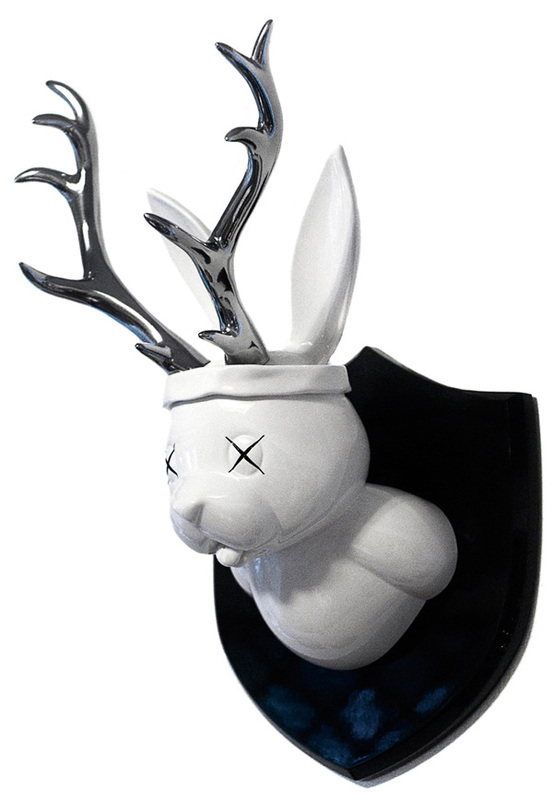 Jack is an assassinated Jackalope, made of cast resin with a UV archival finish. It has a white body, silver antlers and gloss black wood base. Only 10 Jacks will be made, each signed and numbered by Luke Chueh, and will be released on January 13, 2015 for $2,000 each via Strange Love Gallery. Redeem yourself.